In the last post, the Healthy Eating Pyramid was presented. How does this translate to what we actually put on our plate? This is where the Healthy Eating Plate comes in. It serves as a guide to help people make the best eating choices. The Healthy Eating Plate is shown below followed by the key points. Copyright © 2011 Harvard University. 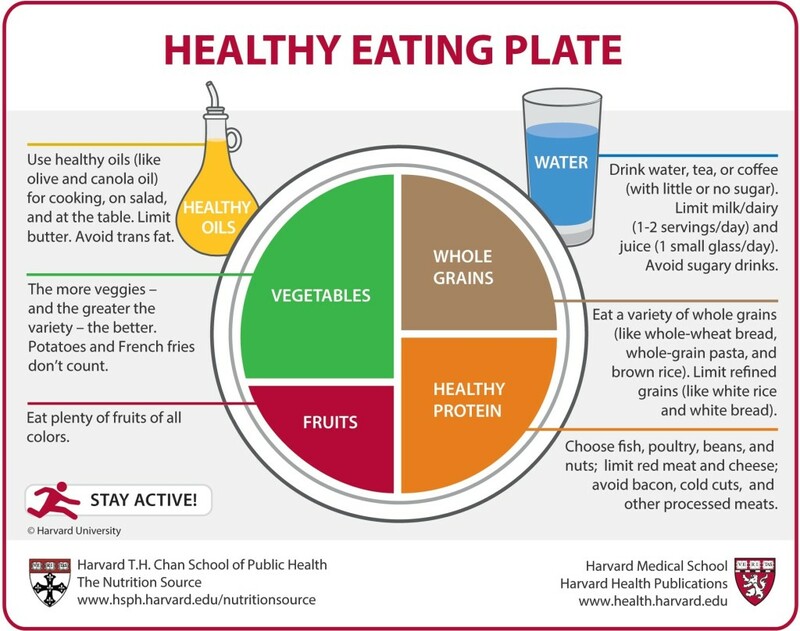 For more information about The Healthy Eating Plate, please see The Nutrition Source, Department of Nutrition, Harvard School of Public Health, http://www.thenutritionsource.org. Fill half of your plate with vegetables and fruits. The more color and variety the better. Remember potatoes and French fries do not count as vegetables because of their negative effect on blood sugar. Fill a quarter of your plate with whole grains, not just any grains. Whole grains include whole wheat, oats, brown rice, quinoa, buckwheat, millet, hulled barley etc. Foods made from whole grains should also be included, like whole wheat pasta. Whole grains are healthier because they have a milder effect on blood sugar and insulin than refined grains (white rice, white bread, pasta). Fill a quarter of your plate with healthy protein. Keep in mind that some sources of protein (fish, poultry, nuts, beans) are healthier. They can be mixed into salads or served on a plate with vegetables. Limit red meat and avoid processed meat, like sausage and bacon. Enjoy healthy fats. The glass bottle near the Healthy Eating Plate is a reminder to use healthy oils, like olive and canola, in cooking, on salads, and at the table. Drink water, coffee, or tea. Complete your meal with a glass of water, or if you’d like, a cup of tea or coffee. Limit milk and dairy products to one to two servings per day and juice to one small glass a day. Skip the sugary drinks. Stay active. The figure scampering along the bottom of the Healthy Eating Plate’s place mat is a reminder to stay active for weight control. In addition to recommending the healthy carbohydrates, like fruits, vegetables (other than potatoes), and whole grains, the Healthy Eating Plate encourages the use of healthy oils and does not set a maximum on the percentage of calories people should get each day from healthy sources of fat. The Healthy Eating Plate therefore recommends a moderate fat diet. Personally, I was on a low fat diet for one year and lost 22 pounds. However my blood cholesterol increased from 218 mg/dL to 228 mg/dL. I then switched to using The Healthy Eating Plate as a guide to plan my meals over the next two years. In that time I lowered my blood cholesterol from 228 mg/dL to 147 mg/dL and also lost 44 pounds. I printed a copy of the Healthy Eating Plate and refer to it regularly.